When your résumé includes winning the 2015 FIFA Women’s World Cup, scoring the NWSL’s Rookie of the Year award, posing for the cover of Sports Illustrated with your teammates and qualifying for the 2016 Summer Olympics in Rio de Janeiro, well, you might say you’re winning at life, to boot. 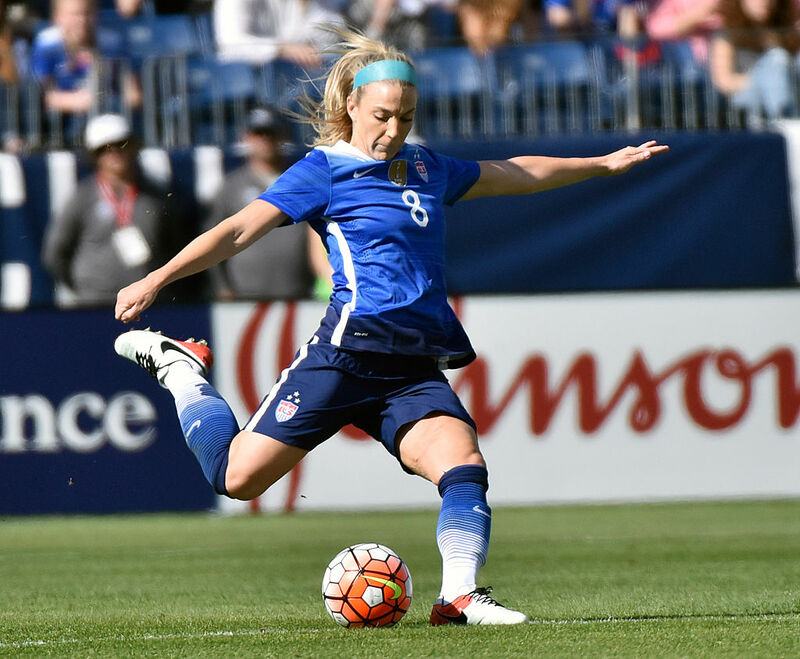 Chicago Red Stars defender Julie Johnston is one of few people who will ever know what it takes to train hard for the Olympics, but at 24, her job comes so second nature to her that she makes it sound like a breeze. Chalk up her cool composure to the fact that she keeps her eye on the prize. Johnston, who lives with two teammates, starts a typical day at 7:30 a.m. She begins with warm-ups and training on the field, includes weightlifting and yoga and concludes with a sensible, healthy dinner. Things are about to get even tougher, though, as she begins zipping from her home base in Chicago, where she trains with the Red Stars, which selected her in the first round of the 2014 NWSL College Draft, to various camps across the country to train with the national team in preparation for Rio. Johnston began playing soccer at age 4 near Phoenix, Arizona. She says her family pushed her — a little — but that they encouraged her to try out several sports and ultimately supported her when she narrowed it down to just one. “We became a soccer family,” Johnston says. “We sacrificed a lot. My family drove an hour one way, an hour back.” At age 9, her passion for soccer drove her to get out on the field and train without anyone prompting her to do so. Johnston’s older sister also played soccer, and she looked up to female players like Mia Hamm, who, during Johnston’s formative years, grew the sport in such a significant way (leading the women’s national team to win gold medals in both the 1996 and 2004 Olympics) that women’s soccer gained an incredible following in a short amount of time. Johnston doesn’t take her role model status lightly — and it’s one of the reasons she and other teammates have felt compelled to speak out about the gender pay gap in women’s and men’s soccer. In a 2015 interview with Forbes, Johnston, Alex Morgan and Shannon Boxx were vocal about their opposition to the fact that more than 20 million people tuned in to watch women’s soccer last summer, yet the pay cap for female soccer players is 11 times less than it is for men. Although Johnston doesn’t get specific with numbers, she is crystal clear about the changes that have taken place in women’s soccer in recent years that warrant a close in the pay gap. One of the ways Johnston and other players are growing the sport is through their interaction with fans on social media, where folks love learning more about their private lives off the field. Johnston has more than 400,000 Instagram followers — and more than 62,000 of them “liked” a photo showing her saying “yes” to NFL star and boyfriend Zach Ertz, who proposed to her in February at Sunken Diamond baseball field in Stanford, California, where the couple first met. When it comes to juggling a career in women’s soccer, training for the Olympics, planning a wedding and trying to maintain a relationship, Johnston says she and Ertz, a tight end for the Philadelphia Eagles, keep an open line of communication and understanding. That time may be limited now, but it will all be worth it when the entire nation cheers for Johnston and her teammates as they open Group G in Rio on Aug. 3 against New Zealand. Go, Team USA! To learn more about Johnston, visit teamusa.org. The Olympics begin on Aug. 5.